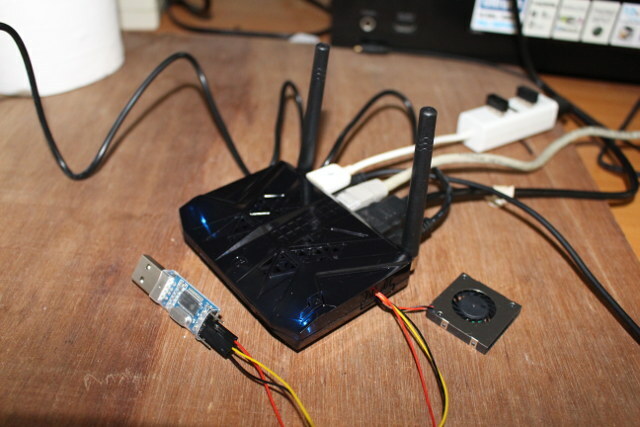 This week-end I checked out GeekBox TV box, and Landingship baseboard, explained how to connect the two together and install various optional accessories such as an RTC battery and a cooling fan. 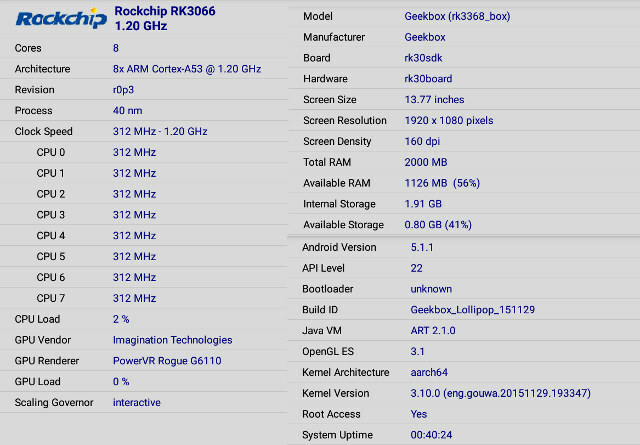 GeekBox comes pre-loaded with Android 5.1 + Ubuntu dual boot image, and as I’ve already reviewed other Rockchip RK3368 TV boxes, and GeekBox is also a development platform, I’ll simply run several benchmarks on GeekBox, as well as test SATA performance with an SSD connected to Landingship carrier board in Android, before checking out the Linux part a little latter. That’s no quite how you want to place the fan, but I wanted to show the USB to TTL debug board and other wires can be connected with the case closed. This allowed me to easily check whether the fan was spinning during testing, and it never did… According to one forum post, the temperature currently needs to reach 80 C for the fan to spin, so I may not have pushed the device enough for this. Geekbox is very small, so you won’t quite connect as many cables and devices as usual since it simply has less ports, so I did not connect a USB hard drive this time. Once you connect the power nothing will happen, and this is normal, as you need to press the power button on the front right to turn it on. You should quickly see two blue LEDs turn on, and within 25 seconds have access to the home screen. The system automatically detected LG 42UB800T 4K UHD television and set the video output to 2160p @ 60Hz, but as usual the user interface resolution is 1920×1080. GeekBox is also a ready to ue Android TV box with Google Play Store, Kodi, YouTube and Netflix apps pre-installed. Since the firmware supports both Linux and Android, only about 10GB of the flash is accessible in Android with a smallish 1.91GB “internal storage” partition for apps, and a 8.18GB “NAND Flash” partition for data. If you press the power button on the remote for about 2 seconds, you’ll find the power menu with Power off, Reboot, and Reboot to Linux OS. 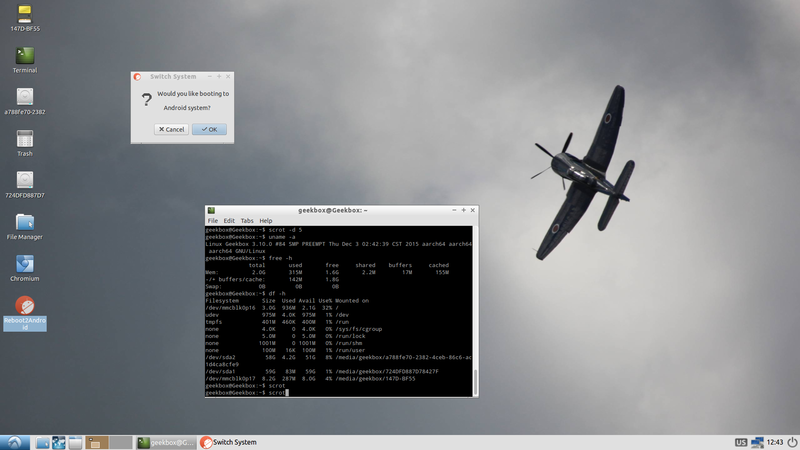 Android 5.1.1 is running on top of Linux 3.10, just like on other RK3368 devices like Zidoo X6 Pro. The firmware is rooted, and kernel is a 64-bit one (Aarch64). Antutu 6.0 is the new release of the popular benchmark, and it’s the first time I run it on a Rockchip RK3368 platform. 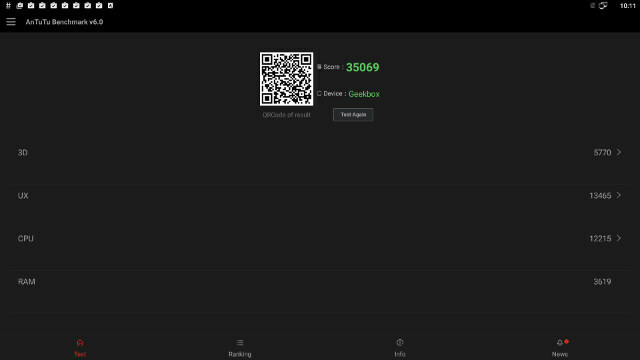 Interestingly enough, the 35,069 points score in Antutu 6.0 with Geekbox is quite similar to the score (34,171 points) in Beelink i68 and Antutu 5.7.1. You can get the detailed results for GeekBox here, where you’ll see that contrary to Amlogic S905 SoC with a weaker GPU, the PowerVR G6110 GPU in RK3368 managed to complete Marooned 3D graphics test. However, Amlogic S905 TV boxes are still found to be slightly faster in Antutu 6.0 with 36,741 points for Tronsmart Vega S95 Telos, and for MINIX NEO U1 media hub. 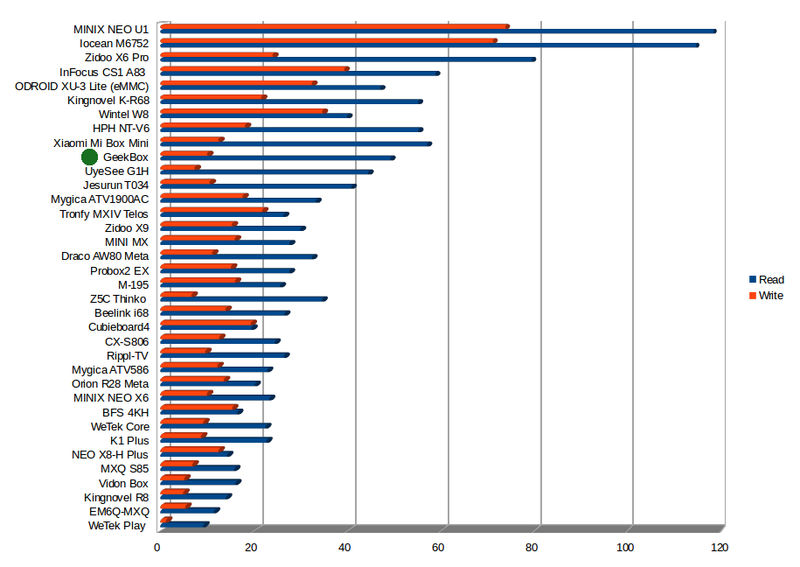 I’ve also run Vellamo 3.2 to have a better comparison with some other Android TV boxes. 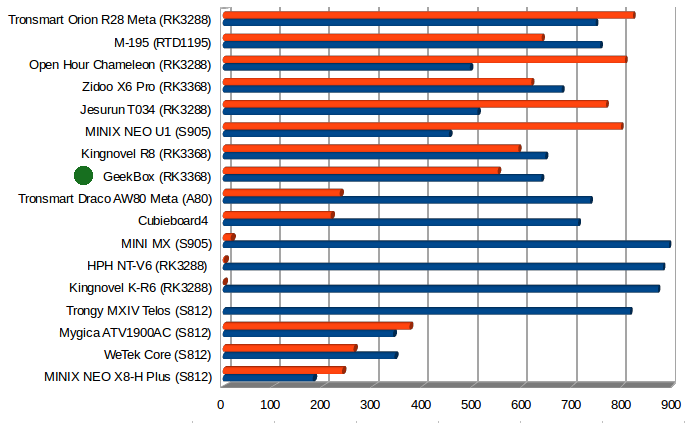 The comparison chart shows the Browser results are pretty much equivalent between devices based on Amlogic S812 / S905, and Rockchip RK3368, while somehow Rockchip octa-core processor features lower in the multicore scale. 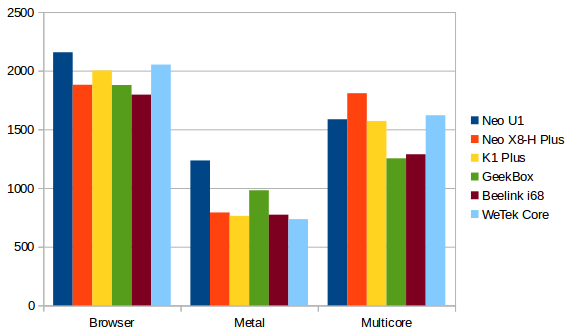 and MINIX NEO U1 has a non-negligible edge for the Metal score. 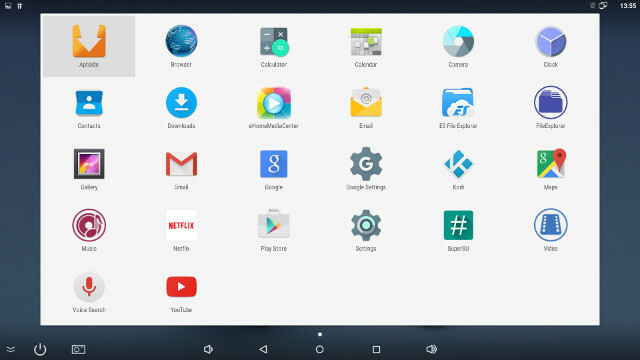 All devices are running Android 5.1, except MINIX NEO X8-H Plus with an Android 4.4 firmware at the time of the review. I’ll test WiFi 802.11n @ 2.4GHz, and WiFi 802.11ac by transferring a file between SAMBA and the internal storage, while using iperf to test full duplex performance of the Gigabit Ethernet port. 802.11n (130 Mbps connection) throughput was a little disappointing @ 1.99 MB/s or less than average, but 802.11ac (468 Mbps connection in Android settings) was relatively decent @ 4.25 MB/s (34 Mbps), although we may have expected more out of AP6354 867 Mbps WiFi module, and something closer to Mygica ATV1900AC or MINIX NEO U1 performance. For some reasons, the upload speed was much faster (39 seconds on average) than the download (about 1 minute 30 seconds), and if download speed was equivalent to upload speed, GeekBox would have had a similar throughput as ATV1900AC TV box. I’ve run iperf -t 60 -c server_ip -d to test Gigabit Ethernet throughput in both directions, and Geekbox does work, although performance is not outstanding. At least the transfer does not collapse on one side of the transfer, and the Ethernet performance is similar to other RK3368 devices. I’ve started by running A1 SD Bench on the 8.18 GB internal storage partition, where the read and write speeds were respectively 49.22MB/s and 10 MB/s. That’s above average, but I would have wished an eMMC with a faster write speed to have been included with an RK3368 device selling for a premium. I’ll skip, direct USB performance simply because Landingship had a SATA port, that is also implemented via a USB to SATA bridge (JMicron JM20329). So I open GeekBox to take out the board, and insert it into Landingship where I have connected a 2.5″ SSD drive that I got with CubieTruck Metal Kit. So for some odd reasons read speed is slower than write speeds,. I also had to run the benchmark on the EXT-4 partition three times, as the first two times, A1 SD bench would just exit by itself. The write speed is quite OK for a USB 2.0 connection, but the read speed could probably be improved (with some software tuning?). For reference that SSD achieved close to 180 MB/s read speed and 36MB/s write speed in Bonnie++ benchmark while connected to the SATA port of CubieTruck board (Allwinner A20). The good thing is that I have not found any major flaws with the Android benchmarks, and GeekBox performance is above average in most tests, except 802.11n WiFi with my setup, but not outstanding. 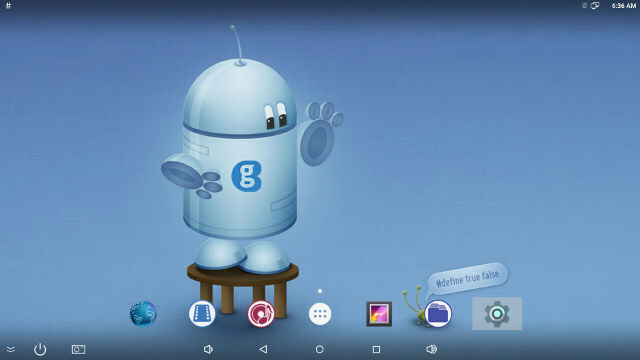 The main advantages of the platform are operating systems support (Android, Ubuntu, and Light Biz OS), hackability with expansion headers and hardware add-ons such as touch screen panel, and hopefully a community that will grow overtime. I’d like to thanks GeekBuying for sending a GeekBox kit for review. If you are interested, and GeekBox sells for $109.99 shipped, and you can also get Landingship baseaboard for $29.99, and other accessories on the same page. 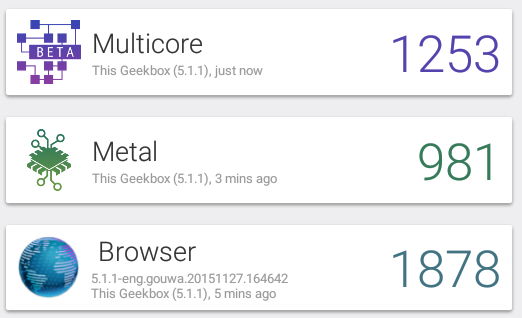 Support is also available on GeekBox forums, and if you want to modify or improve Android 5.1 operating system for the platform, you’ll find the SDK on Github. [Update: Since I plan to use a firmware image running Ubuntu (Actually Lubuntu) only instead of the dual boot image, I’ve quickly tried the dual boot in GeekBox with the pre-loaded firmware. Ubuntu has it own 3.0GB partition, and can also access the 8.18GB “NAND Flash” partition found in Android. 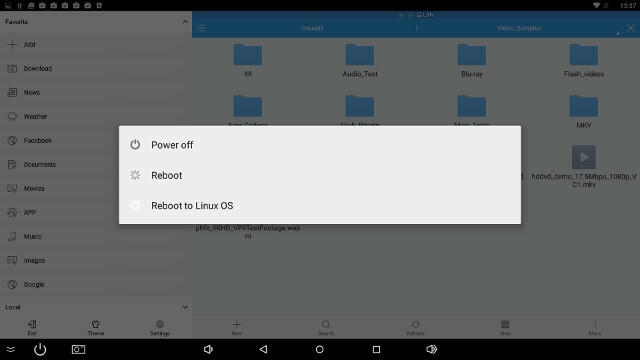 Clicking on Reboot2Android icon will pop-up a menu asking you whether you’d like to reboot to Android system. The next step will be to checkout Ubuntu and Light Biz OS. I’m not sure in which order yet…. So the Antutu benchmarks were all run in 32-bit, right? Lol. I got confused with RK3288… I’ll change that right away. About Antutu. Correct, it did not switch to 64-bit test, so I guess while the kernel is 64-bit the Android rootfs is not. 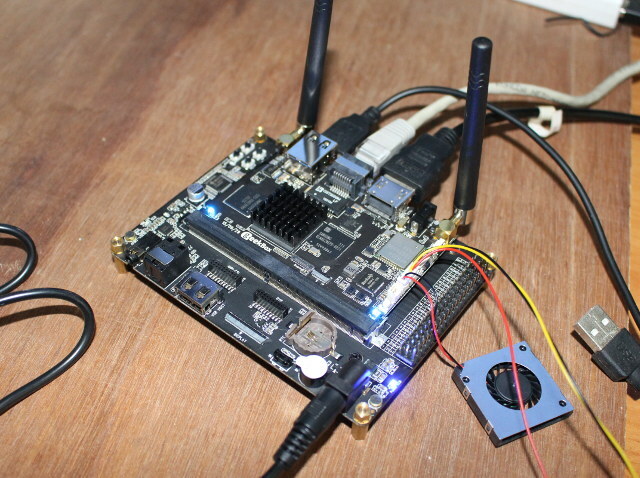 The only platform that ever switched to Antutu 64-bit for me was DragonBoard 410c. Has thermal throttling been taken into account? The last octa-core SoC I tested wasn’t able to show its potential performance without both heatsink and fan. 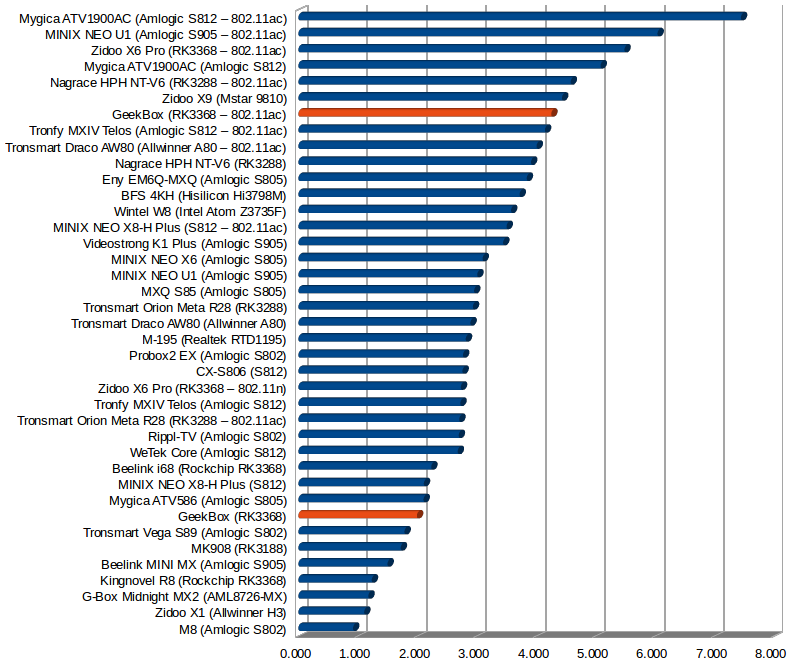 I’ve only run Antutu and Vellamo… not really heavy load benchmarks. I’ve never seen the fan spin, so at least it has never reached 80C, and the should not have throttled. I don’t think I’ve never seen throttling affect Antutu benchmarks, except on Zidoo X6 Pro when I ran some other programs for an extended period of time before running Antutu, and then it really crashed the score. Please check performance in Ubuntu. Which movie player could be used in Ubuntu ? 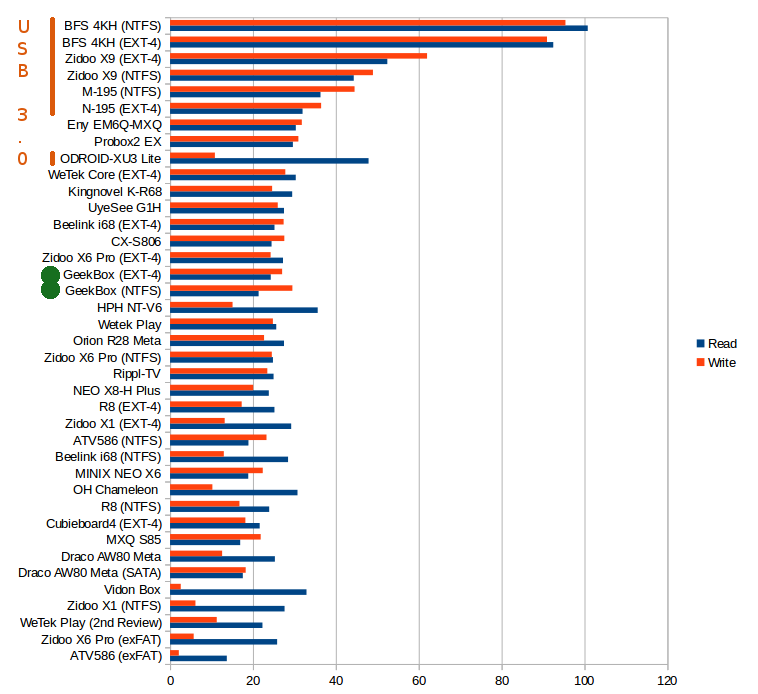 Which Ubuntu version is shipped with the device e.g. 15.10 ? Try to restore factory settings. If that does not work, reinstall the latest firmware.